Staffan de Mistura, UN Special Envoy for Syria, briefs the Security Council, via video conference. 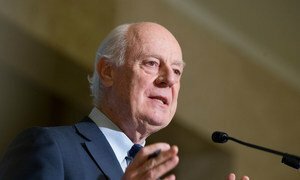 “International players are clearly looking for some common ground based on the implementation of Security Council resolution 2254 (2015), and are urging Syrians to begin to find some common ground too,” UN Special Envoy for Syria Staffan de Mistura told a Security Council meeting in New York via video link from Geneva. As mandated by resolution 2254, the talks focus on governance, a schedule and process to draft a new constitution and the holding of elections as the basis for a Syrian-led, Syrian-owned process to end the conflict. Mr. de Mistura said that in preparing for the eighth round of intra-Syrian talks, he called for “real” diplomacy, with his messages focused on several points, such as that the Government and a united opposition should engage in negotiations in Geneva without any preconditions and that all other initiatives should support this UN mediation process. He noted that some important meetings have recently taken place in Viet Nam’s DaNang, Russia’s Sochi, and Saudi Arabia’s Riyadh that might help the Geneva process. In DaNang, Russian President Vladimir Putin and United States President Donald Trump affirmed that the political process “must include full implementation of Council resolution 2254. Mr. de Mistura, however, noted the Government has not yet confirmed its participation in the new round of the UN-facilitated Geneva talks. In Riyadh, an expanded opposition conference was convened last week, with all three groups mentioned in resolution 2254 present. The Syrian Negotiations Commission formed in Riyadh is travelling to Geneva. "Assuming that both parties arrive in Geneva, we will be looking to move them into beginning serious discussions and hopefully negotiations. Let me make one thing clear: we will not accept any preconditions from either party,” he said. He also stressed that more than 200 civil society actors will be engaged in the UN-led political process in Geneva over the next weeks. He said he is invited to participate in a preparatory meeting on Tuesday that France organized to bring together representatives of the five permanent members of the Security Council – China, France, Russia, United Kingdom and the United States – in Geneva. As for a large gathering on Syria in the near future that Russia is planning, Mr. de Mistrua said it is premature for him to say anything about that initiative. “I will continue to view this proposal and all other initiatives through the same prism: does it contribute to effective UN-led intra-Syrian negotiations in Geneva to implement resolution 2254,” he said. Syria has been at war for the last six years. Half of its population have fled their homes, and, according to the UN’s relief wing, some 13 million people require humanitarian aid, including nearly three million trapped in besieged and hard-to-reach areas. Reconstruction will cost at least $250 billion. Syrian opposition groups meeting in Saudi Arabia should do all they can to unify ahead of a fresh round of United Nations-facilitated talks in Geneva, UN Special Envoy Staffan de Mistura said on Wednesday.